As a child he studied under Konstantinos Volanakis. In 1906 he went to Paris in order to study naval architecture, but in 1909 he droppedout of the École des Mines in order to attend lectures at the École des Beaux-Arts, possibly as a guest student. In addition to his participationin group exhibitions, his work was shown in solo exhibitions in Paris (1913, 1920) and London (1920). 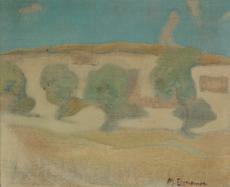 Upon his return to Athens in 1926,he held his first solo exhibition in Greece. He pursued his career as an artist until, in 1932, he was placed in an Athens psychiatric asylum,the Dromokaiteio, where he died. His landscapes depicting both Greece and France, which form the exclusive subject matter of his paintings, reflect a poetic and dreamliketreatment, which was informed by the achievements of Post-Impressionism.